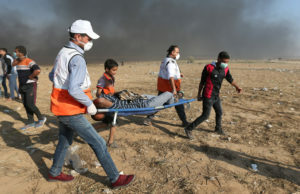 Earlier this week, at least 58 people were killed and 2,700 people injured in the bloodiest day of protests in Gaza since the 2014 war with Israel. 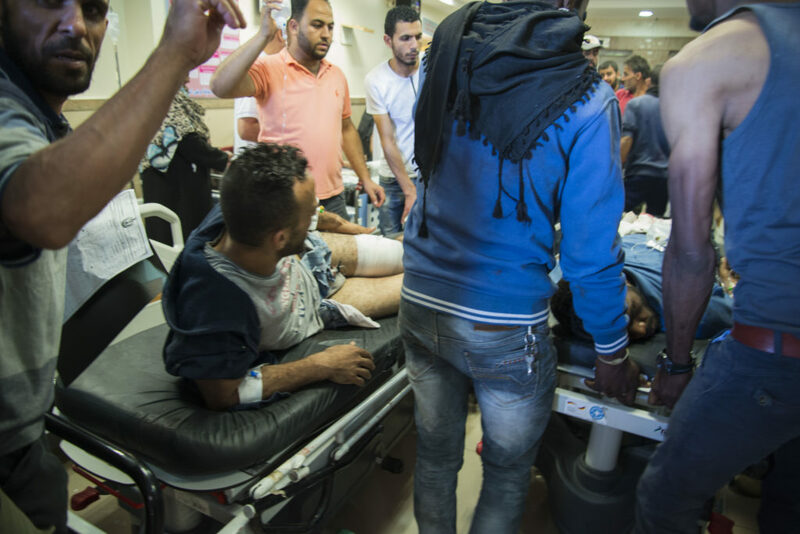 Protests had scaled back Wednesday with the start of Ramadan, but the wounded lined the halls of local hospitals, awaiting treatment from overtaxed medical staff. 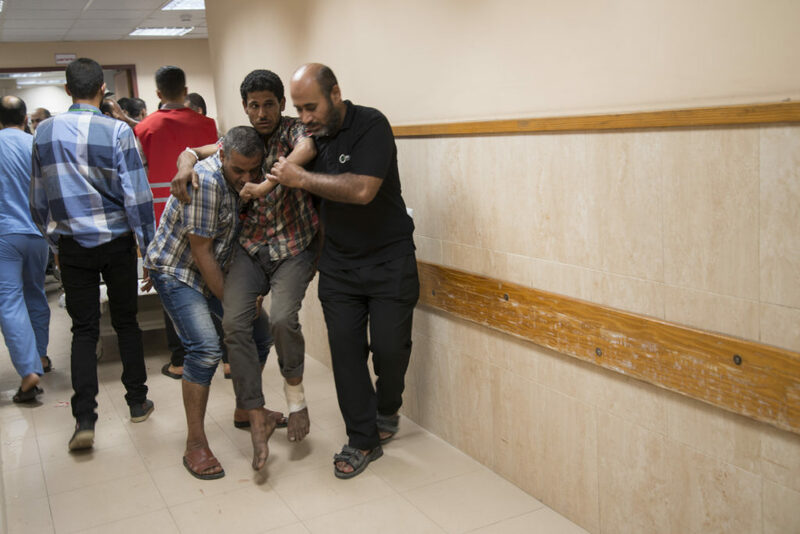 The 2,700 people injured included 1,360 by live fire, according to the Gaza Health Ministry. Many of those injuries occurred Monday when Israeli forces fired on protesters running toward the security fence. The wounded and dead were carried away on stretchers and brought to hospitals at rates of sometimes several hundred per hour. “There were not enough beds, not enough medical staff to treat them. So it was very difficult,” said Marie-Elisabeth Ingres, Doctors Without Borders’ representative in the Occupied Palestinian Territories. The injuries were severe: multi-fragmented bones and torn tendons, Ingres said. About 40 percent of them had such a high risk of infections and complications that they needed to be transferred out of Hamas-controlled Gaza for treatment. Some were approved for transfer, and the doctors were pushing for more, she said. “The mere fact of approaching a fence is not a lethal, life-threatening act, so that does not warrant being shot,” he said, according to a BBC report. Israel defended its actions and accused Hamas of using protests to hide attacks, justifying its use of lethal force. The Israeli military said rubber bullets are not effective in holding back demonstrators from approaching and breaching the security fence. Haley cited Israeli military accounts that some protesters were using Molotov cocktails attached to kites and other dangerous tactics. “No country in this chamber would act with more restraint than Israel has. 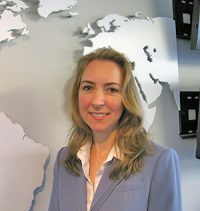 In fact, the record of several countries here today suggest that they would be less restrained,” she said. Palestinians organized the six-week demonstration called the “Great March of Return” in the eastern part of the Gaza Strip along the Israeli border. Tens of thousands of protesters gathered to demand that Palestinian refugees and their descendants be allowed to return to Israel, and that Israel ease its blockade of the territory. The protests escalated Monday, the day the U.S. Embassy opened in Jerusalem, which also was the 70th anniversary of Israel declaring its independence. Tuesday was the 70th anniversary of what Palestinians call the “Nakba” or “catastrophe,” when hundreds of thousands of Palestinians were forced to move out of Israel in 1948. Many of those demonstrating were men in their twenties, Ingres said. In Gaza, young people have a 60 percent unemployment rate. “There is no possibility to have a life,” and they feel like they have nothing to lose, she said.